Selsey extended their unbeaten run to four games after 3-1 win at Oakwood. First half goals courtesy of Lindon Miller, Ryan Morey and John Phillips ensured the hosts could not stage a comeback despite a consolation in the 37th minute through Joshua Neathey. Selsey boss Daren Pearce was pleased with his side’s performance in their penultimate away match. Selsey’s predomiantly youthful side are fifth in division one and Pearce has been impressed with the togetherness the squad has had this season. Currently 13 points clear of Littlehampton in sixth position, Selsey can still potentially finsh above AFC Varndenians in fourth. 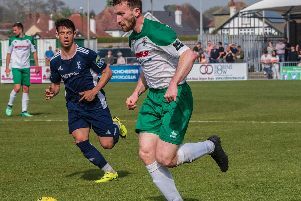 Ten-man Midhurst & Easebourne held title-chasing Bexhill United 1-1 in their final home fixture of the season. After an even 30 minutes, Harry Giles had the best opportunity to open the scoring when he broke through on goal – but he blazed the ball over the bar. The visitors had good chances, with Josh Bird in the Midhurst goal producing some fine saves, before Mark Broughton had one of the best chances of the half for the hosts but headed wide from six yards. Giles caused Bexhill’s defence problems and in the 33rd minute he burst through again, this time being bundled over inside the area, winning a penalty. Josh Sheehan placed it in the bottom corner, giving Rose in the Bexhill goal no chance. Five minutes before the break Midhurst full-back Aaron Behan was controversially dismissed for a second bookable offence. The visitors started the second half well and in the 50th minute Jack Shonk scored a magnificent overhead kick to draw them level. It was the start of a real test for the Stags, who came under lots of pressure, but their well-orgainsed defence kept Bexhill’s attack at bay. In the final 10 minutes Midhurst asked the questions with substitutes Gary Norgate and Liam Dreckmann both close to snatching a winner for the hosts. Midhurst: Bird, Behan, Meeritt, R Carter, Broughton, Farr, Wyatt, Brown, Slater, Giles, Sheehan. Subs: Casselton, Norgate, Dreckmann, Fewell, K Carter. Sids were beaten by league leaders Alfold, a goal in either half sealing their fate. Sids gave a decent account of themselves against a very good side but quality finishing was the difference on the day. Ex-Chi City forward Joao Andrade scored both goals to consign Sids to another defeat in which, had they taken their chances, they may have got some reward. Fraser Smith went closest to scoring for the visitors, crashing an effort against the bar with the keeper beaten. Sids have no game now until Easter Monday when they host neighbours Selsey (11am) in what is sure to be a decent game. Sids: Boughton, Dines, Corell, Low, Heath, Madden, Lynch, Chittock, Dean, Mepham, Smith.